Rifle shooters have long understood the value of recoil-reducing devices, but based on what I see at most ranges, handgunners haven't tumbled to it yet. Short of porting or changing grips, there's not much you can do to the gun, but you do have a wearable option in the form of gloves. Recently I was headed to the range to work on a couple of projects and was faced with, among other things, giving my five-inch S&W 629 a workout with full-power .44 Magnum loads. That's more recoil than I feel like dealing with, so I rummaged through my stuff and came up with a Smith & Wesson shooting glove (which, unfortunately, the company no longer catalogs). It has gel foam pads in the palm to cushion recoil and suede to provide a nonslip grip. I put more than 50 rounds of .44 Magnum downrange, and at the end I was still breaking good shots. And therein lies the beauty of recoil reduction. It's not just about comfort, although that certainly isn't a bad thing. Reducing felt recoil to a manageable level allows you to work on mechanics such as sight alignment and, most importantly, trigger control for a longer period of time before the body's natural rebellion against the jarring causes you to flinch. 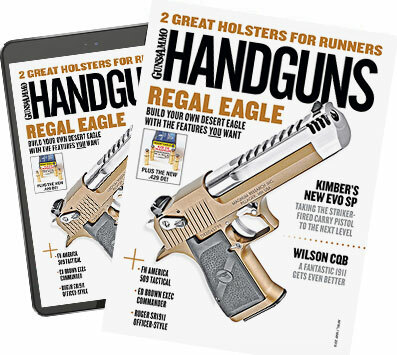 There are a couple of handgun gloves on the market, which, while I haven't tried them, come from trusted companies that know what they're doing. So if you want to improve your handgun shooting, especially the big revolvers, check out gloves from PAST, Cabela's and Uncle Mike's. You'll be glad you did.